Every Memorial Day weekend, swimming pools across the nation open their doors to eager swimmers. To help pool operators and swimmers ensure a safe, healthy, and enjoyable swimming experience for everyone, May is designated National Water Safety Month and the week before Memorial Day is designated National Recreational Water Illness and Injury (RWII) Prevention Week. This year’s RWII Prevention Week is May 19–25 and focuses on how public health officials, aquatics staff, swimmers, and others can prevent pool chemical injuries, illness outbreaks, and drowning. Centers for Disease Control and Prevention: RWII Prevention Week – This year’s RWII theme is “Healthy and Safe Swimming: We’re in it Together.” It highlights swimmer hygiene and the need for swimmers to take an active role in helping to protect themselves and prevent the spread of germs. National Water Safety Month – National Water Safety Month is a joint collaboration among the Association of Pool & Spa Professionals, the American Red Cross, the National Recreation & Park Association, and the World Waterpark Association. It focuses on making aquatic activities safe and enjoyable. Centers for Disease Control and Prevention: The Model Aquatic Health Code – The Model Aquatic Health Code that can help LHDs and other authorities make swimming and water activities healthier and safer. It includes guidance on codes, rules, regulations, laws, or standards governing the design, construction, operation, and maintenance of public swimming pools, spas, hot tubs, and other disinfected aquatic facilities. Centers for Disease Control and Prevention: Recommendations for Preventing Chemical Associated Injuries – This webpage contains resources for preventing pool chemical-associated injuries in treated recreational water venues. NSF/Axiall Corporation: For Safety’s Sake NSF-certified chlorination system guide – This guide helps LHD officials spot improper operation of the Accu-Tab® Chlorination System. Users can also order a free copy. Centers for Disease Control and Prevention: Drowning Feature – About ten people die every day from unintentional drowning. This feature provides tips for preventing drowning. Centers for Disease Control and Prevention: Protect the One You Love – Part of CDC’s Safe Child program, this webpage contains information on preventing children from drowning. Safe Kids Worldwide: Water Safety at Home – This webpage contains a variety of resources to keep kids safe from water-related injuries in the home. It includes top tips for water safety at home. Centers for Disease Control and Prevention: Recreation Water Illnesses – The number of recreation water illness outbreaks associated with swimming has increased substantially in the past two decades, according to the CDC. This webpage helps swimmers learn the facts about recreation water illnesses. Centers for Disease Control and Prevention: Illnesses and Prevention Tips – Learn the facts about the most common illnesses associated with recreational water and how to prevent them. 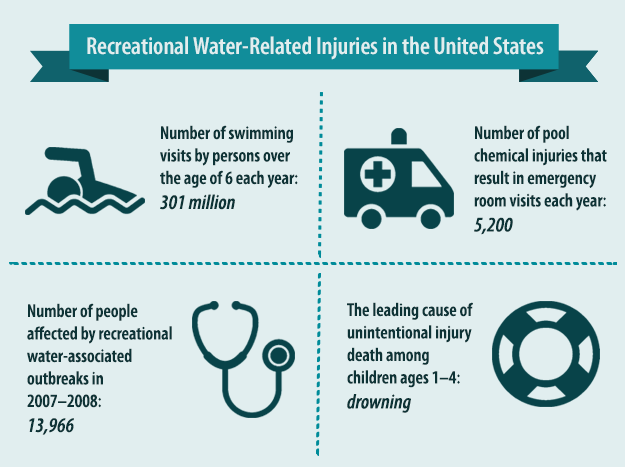 Centers for Disease Control and Prevention: How Can We Prevent Recreational Water Illnesses? – This webpage, also available in Spanish, lists steps swimmer can take to stay healthy. This entry was posted in environmental health on May 21, 2014 by nacchovoice.